With this episode TWiV is three years old. 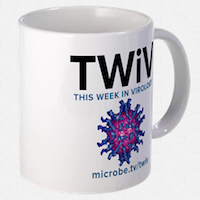 Click the arrow above to play, or right-click to download TWiV 150 (56 MB .mp3, 93 minutes). Thanks for another nice TWIV. I think the discrimination of the contaminant is better explained by the fact that controls and patients were not collected and handled in exactly the same way before they were blinded/tested. It seems likely that contamination crept into (some of) the CFS patients’ samples before they were “mixed” with the control samples. “While we were aware that other co-authors had tested samples and claimed to not find evidence of plasmid contamination, those co-authors were unwilling to provide their data for examination so we were unable to comment on the validity of the other experiments. I don’t get why they didn’t do that and I’d like to hear your thoughts on this. Given this, I think they should have demanded relevant data from these co-authors. Even better, they should ask the co-authors to let their positive Lombardi et al. samples tested by other labs (e.g. the Silverman lab), of course using proper blinding and controls. This would seem (at least, to me) a pretty easy way to check if the contamination reported by Silverman originated in the WPI lab. RRM you claim to have read the literature and then make statements that would prove you to be lying. Either that or you are questioning the integrity and honesty of Frank Ruscetti and Judy Mikovits. The only VP62 contamination was found in Silvermans samples, which he used to clone and fully sequence sequence. The WPI and NCI have provided scientific proof from an independent lab their samples do not contain VP62. In fact the CDC also confirmed this when they retested 20 positives. All the data from Lombardi et al. is in the public domain. The Bruce Albert quote is from months ago, and no one knows what data he is referring to as it is all in the public domain. What data have you imagined is not in the public domain RRM? When were you in their labs?Pathak and Coffin omitted use of a third assay from their paper claiming to have found the origin of VP62. That should be an automatic retraction of that paper. Also because VP62 wasn’t created in the 1990s but in 2006. Sorry for the late response but I am seeing this reply just now. Your quote only addresses the handling and procedures AFTER the patient and control samples were “brought together” for this study. It does nothing against the fact that controls and ptients were not collected and handled in exactly the same manner BEFORE they were brought together, which was what I asserted and which can PERFECTLY explain what I asserted that it could explain. BTW: The Bruce Alberts quote is not from “months” ago. It is a very recent quote which is SPECIFICALLY addressing the refusal of the other authors to share their data regarding the VP62 plasmid contamination that was reported by Silverman. You are seriously deluding yourself concerning these issues. It has been conclusively proven that samples were not contaminated at the WPI and NCI and that the VP62 plasmid was never in the WPI or NCI labs. You have deluded yourself if you think that has not been proven. This was the containers used as they were sent to Silvermans lab that are not contaminated and there is not other evidence of contamination of any kind. Samples from patients with ME were tested at the WPI and NCI and found to have HGRV gag sequences by nested and nested RT PCR. These samples were independently reanalyzed and were negative for mouse mitochondrial DNA and IAP sequences. Just as importantly the gag sequences were not VP-62 and no trace of the VP-62 plasmid was detected. Aliquots of these samples were sent to Silvermans lab for sequencing. These were never sent back to the WPI or NCI. 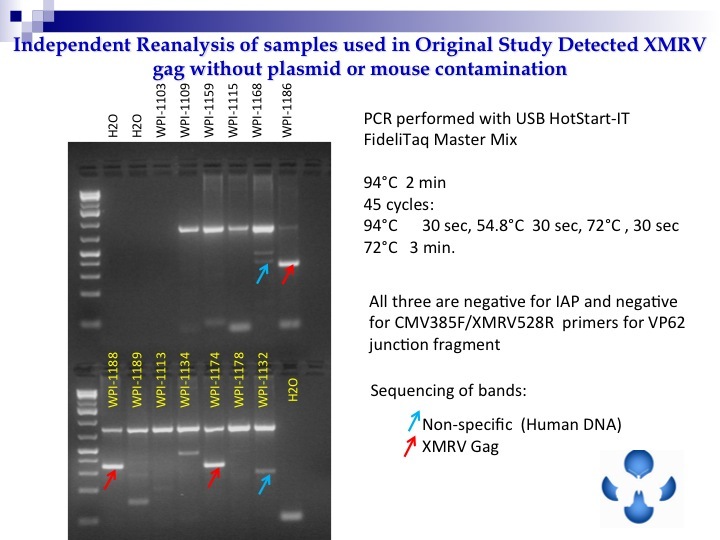 Silverman used a single round PCR and reported the detection of gag and env sequences of VP-62. Follwing PCR his samples contained the VP-62 plasmid, when the samples sent to him did not. Silverman introduced the VP-62 plasmid into his samples and sequenced the introduced VP-62 and not the retrovirus in the samples sent from the NCI and WPI. The wpi and NCI were unable to find anything in the portion of the samples that they retained using Silvermans primers and cycling conditions. This means that the HGRVs in the Lombardi cohort were not VP-62 and that explains the 00 studies and the BWG results. Frank Ruscetti knows a bit about discovering new retroviruses and has obviously taught Dr Mikovits well. Trust their science and not the words of politicians with science degrees. Racaniello does so much spinning that he should be called professor gyroscope. Silvermans integrity is not being respected with blogs like this one. Levy replicated Silvermans methods and not those of the NCI and the WPI. 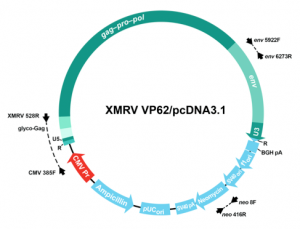 Levy then used an R-PCR that could only detect VP-62 because of high stringency primers. The viruses detected by the WPI and NCI have nothing to do with VP-62. Will Science be retracting the Levy paper? Shouldn’t the CFS patient community be happy that science works and a wrong hypotheses is being dropped in favor of truth? * You mentioned that the $2.3 million for the Lipkin study should better be used for something more worthwhile. That may indeed be a good idea, but the problem is that it won’t be used for researching CFS, but for something entirely different. From the point of view of a CFS patient, the latter is actually the misappropriation of resources, not the former. * Again from the point of view of a CFS patient, science seems to work rather unilaterally, namely only when it doesn’t benefit them. The hypothesis that CFS is a purely psychosomatic disease has been scientifically falsified, but a large portion of the small CFS resources are still channeled into this false hypothesis. Science doesn’t work here? I think that your view on “that’s how science works”, while correct from a philosophical point of view and true on large time scales (centuries), it is overly romantic on short time scales, where personalities, rivalities and funding are the main actors. The WPI and NCI found human gammaretroviruses, only Silverman gave them the wrong name. That hypothesis has been confirmed by Lo et al. I hoped to find a wiki link here re funding for cloud-driven research…..